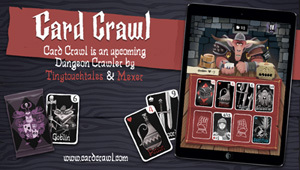 Card Crawl is a solo digital card game for iOS by Tinytouchtales. While it is currently exclusive to iOS, it was built using Unity so it is likely that it could be ported to other platforms. The game is currently priced at $1.99. Update: A version has been released for Android on GooglePlay. Described as "a solitaire style dungeon crawler played with a modified deck of standard cards", Card Crawl is simple to learn and play yet surprisingly engaging. You are an adventurer, you have 2 hand slots and a backpack slot and each turn you must deal with 3 of the 4 dealt cards in one way or another in order to trigger the next draw. Your goal is to make it through the dealer's deck and survive, while wracking up as many points as possible in the process. Local and online leader boards allow you to compare the scores for your runs against your own and others. Points and achievements are earned that can be used to unlock additional "special ability" cards, five of which are shuffled into the dealer's deck each round. A "Constructed" mode is available where you select which of the five cards will be used in the round. Game rounds play out quickly making it the perfect game for on the go or break time. The game has that addictive "one more round" effect and is about the best use of $1.99 I've seen recently. At some point the great 5 minute card/puzzle game Card Crawl was released for Android, joining the previously released iOS version. The game is free to download and play in a limited demo mode on Android, with the full version available for a couple of bucks as an in-app purchase. This is a really fun time waster and worth looking into, refer to the original post for more information. The popular 5 minute card/puzzle game Card Crawl for Android and iOS has received a substantial update in a recent patch. The game's developers Tinytouchtales refer to the patch as the "second content update". The update adds some new features as well as reworking some of the previous ones. First up is a new "dealer" (that strange looking guy to the left) and some new table graphics. Next is a new "Daily Dungeon" mode which adds a new custom dungeon challenge deck for players to try to conquer and compete for high scores on a separate score chart. A second new game mode is called "Streak-Mode" which is unlocked and integrated into normal mode once a player has collected all of the ability cards, after which for each consecutive game won in normal mode you will get an accumulated total score. Once you lose, your streak ends and you have to start again. Streak-Mode also has its own high score chart. Lastly ten all new ability cards are being added to the game, and several of the old ability cards are being reworked, tweaked or re-balanced. 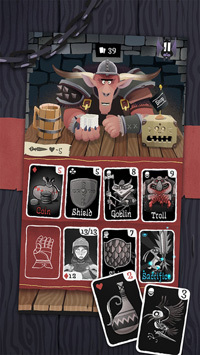 Card Crawl is a great quick play casual solitaire card game and well worth looking into if you enjoy that kind of thing. Refer to the original post for more information about Card Crawl.